Single line cell phone plans aren’t just for college grads and single people. A lot of my professional friends have separate cell phones for work and family. After all, we have two ears. So why not two phones? (Just kidding.) 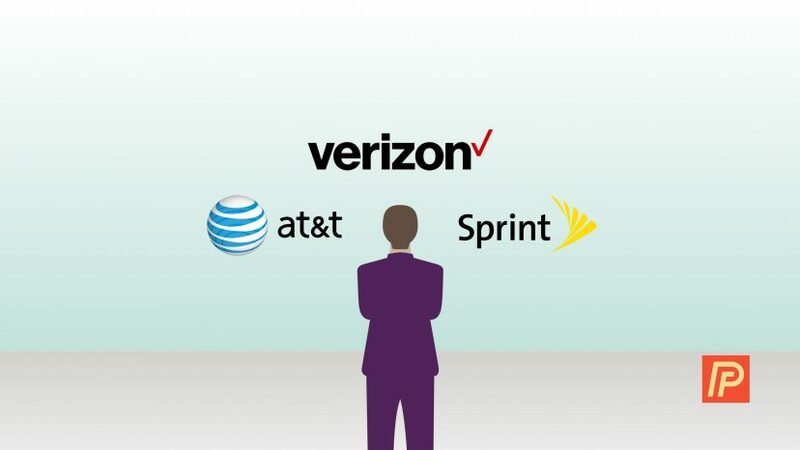 In this article, we’ll compare the single cell phone plans being offered by AT&T, Sprint, and Verizon. I’ve decided to put this article together to help people decide on the best single line cell phone plan for them, because as everyone knows, shopping for cell phone plans can be confusing. If you’re thinking about signing up for more than one line (which can save a lot of money), check out my side-by-side comparison of family plans. You should know that I may receive a referral fee if you click on one of the links in this article, but I never allow money to influence my recommendations or the information I provide. AT&T's single line plans work just like their family plans: You pay an access fee for talk and text that varies according to how much data you buy. To me, AT&T's website gives the impression that unlimited talk and text are included with the data plan you choose. They aren't—I checked with a customer service representative, and the access fee is still there. $25 / line for unlimited talk and text if you buy the 5GB or lower data plan. AT&T is currently offering up to a $650 credit per line if you switch. Sprint is currently offering a 50% discount off your current rate and $725 back in contract termination fees if you switch. Verizon is currently offering to waive all activation fees, but only if you purchase online. T-Mobile’s stock plan includes unlimited talk, text, and data. You'll pay a flat rate and get unlimited everything (for the most part). For example, T-Mobile's unlimited streaming doesn't stream at full resolution — HD is a paid upgrade. If you use more than 26 GB of data in a month, T-Mobile deprioritizes your usage and speeds may slow down significantly. $70 for unlimited talk, text, and data Unlimited data included. After 26 GB of usage, your usage is "prioritized below other customers" and you may experience slower speeds. T-Mobile has no overage charges. T-Mobile is currently offering the new T-Mobile ONE plan. In this section, we’ll look at some real-world examples of how much someone named Suzie might pay for a single line plan with light, moderate, and heavy duty usage. First, let’s pretend that Suzie only uses a light amount of data, which works out to about 1 GB per month. Next, let’s pretend that Suzie needs a one-line plan with a moderate amount of data, or around 4 GB per month. Finally, let’s pretend that Suzie is a real data hog and burns through around 8 GB of data per month. Is Sprint’s Unlimited Data Plan Really Worth It? If you use 12 GB of data or less per month, buy the 12GB (or lesser) data plan. Sprint’s unlimited data plan is only worth it if you use more than 12 GB of data per month. Previous ArticleHow To Search The iPhone App Store: The Beginner’s Guide! I'm a former Apple employee and the founder of Payette Forward, and I'm here to help you with your iPhone.